The festive holidays are a dangerous time of year, spending time with family and friends and generally having a good time away from your computer can be disastrous for an ongoing project. This year, it’s been doubly disastrous for CaseDetective, not only has development time been non-existent and support reduced as usual, but I’ve had time to reflect on CaseDetective’s future, and more importantly on it’s place in my life. I’ve come to the (long overdue) decision that development on CaseDetective is to be put on hold, I’m not going to work on CaseDetective or any other significant development project in my spare time for the foreseeable future. For a long time I’ve struggled to balance time with my family and friends, personal interests and health, (money making) consulting work and CaseDetective, something has to give. My family is everything to me, I love my wife and daughter and the last two weeks have enforced my long standing regret at having to spend a considerable amount of my (and my family’s) free time supporting and developing CaseDetective. There’s also a knock-on effect to the rest of my family and friends, who don’t get anywhere near the attention they deserve, neglecting them makes me sad. I’ve also completely neglected my health in the last few months too. The year started well as I lost a good bit of weight and improved my fitness through running and watching my diet, but running has gone out the window as time got squeezed out by more CaseDetective support and development of version 2.0. I’m feeling very unfit, and am at my heaviest in ten years. I need to make time for running and biking again. I used to love mountain biking in my early twenties, getting up early on a Sunday morning and going for a 25-50 mile ride up and down hills coming home covered in mud was bliss. I want to have the health and time to enjoy physical activities again. Reading and sleeping, I want to do more!!! I think CaseDetective has also impinged on my mind so much that on occasions it may have had an impact on my consulting work. Sometimes I’m so wrapped up in something I’m doing with CaseDetective that I feel I’m not giving my real job it’s deserved attention. That is unacceptable, and with my current contract being a pretty intense project with an aggressive time scale, I can’t afford to slip up because my mind is elsewhere. Many people would have put a stop to development of CaseDetective a long time ago just because of the terrible return on investment. CaseDetective has been in development since September 2004, with a few hiatuses along the way, let’s say that’s 156 weeks (3 years) worth. With a conservative estimate of 8 hours development/support time per week (it was actually full time for about 6 months), that is 1,248 hours. Let’s take a reduced consulting fee of £25 per hour for a grand total of £31,200 worth of my time spent on developing CaseDetective. Seeing as CaseDetective has had a net revenue (according to eSellerate) of approx. £1,885 ($3,771.47), it really doesn’t stack up well, and that’s not even taking into consideration expenditure on tools and hosting etc. One of the major problems I have with CaseDetective though, is that I no longer have any need for it myself. Most of the functionality I need for bug, feature and inquiry tracking is in FogBugz, and I rarely want to report on the data held in FogBugz any longer. So you can imagine that my enthusiasm for developing and improving CaseDetective is somewhat diminished. I still believe CaseDetective could be a great product, and one that I would use if I added some of the features I have planned, but to get it where I want it would take considerable development time. At the moment, I’m simply not willing to commit so much of my free time to make it happen. So development of CaseDetective is on hold. Support for existing customers will continue for the time being (at least six months), but I’m going to take down the majority of the CaseDetective website and stop taking any further sales. There is a slim chance that development could resume if I find myself at a loose end without full time employment so I’m not thinking about selling or otherwise releasing the CaseDetective source code. If there is anyone out there with a product that could help CaseDetective customers continue to extract CSV files and/or PDF reports from FogBugz without having to know any SQL, please drop me a line and I’ll pass your details onto my customer base. If there is a free license or “competitive upgrade” license available, all the better. Thank you to all the great people in the MicroISV/BoS community that have supported me with kind words of encouragement and advise throughout my time developing CaseDetective, you helped me immensely. A big thank you must go out to everyone at Fog Creek, especially Michael H. Pryor, without your help I couldn’t have got as far as I did. Also, thanks to all my customers, thank you for showing your support for CaseDetective in the best possible way, by buying a license! And thank you for being such nice people if we had any communication. And finally, thank you to my wife Mandy, for putting up with my countless hours working on CaseDetective and supporting me all the way. I love you so much. Posted by ianmjones at 2:43 pm on January 3rd, 2008. Categories: CaseDetective, FogBugz, MicroISV, Software Development. 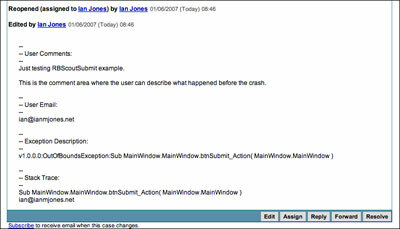 Bug Fix: Error while creating indexs on the Attachment, Cases or CaseEvents table. In some rare cases CaseDetective could not create indexes on it’s cache database due to non-unique data in a primary key, this has now been fixed. Bug Fix: The previous change (1.3.3) for the above bug fix introduced some database incompatibilities. In order to fix the problem across all supported database types, CaseDetective now requires MySQL 5.0+ as opposed to MySQL 4.0+. MS Access and SQL Server 2000+ are still supported as usual. Bug Fix: Mac OS X 10.5 (Leopard) compatibility. Updated tools and some third party libraries for better Mac OS X 10.5 (Leopard) compatibility. Bug Fix: Support FogBugz 6.0 for non-administrators. CaseDetective now supports changes made to the FogBugz 6.0 database schema for permissions, non-administrators can now see their cases! Bug Fix: Improved permissions adherence. Some changes were made to better support permissions, summary filters now correctly miss projects etc that a user does not have permission to see in FogBugz (4, 5 & 6). PLEASE NOTE: This does not mean CaseDetective fully supports FogBugz 6.0, it just means you may be able to use the “classic” filters in FogBugz 6.0 with CaseDetective 1.3.x, you will not be able to use the new search based filters introduced with FogBugz 6.0. Full support for FogBugz 6.0 and it’s new search based filters will arrive in CaseDetective 2.0 and CaseDetective On Demand by early 2008. As always, CaseDetective 1.3.4 for FogBugz is available from the download page. Posted by ianmjones at 9:23 pm on December 13th, 2007. Oops, CaseDetective 1.3.3 pulled, working on CaseDetective 1.3.4. Oops, turns out CaseDetective 1.3.3 wasn’t so good for all database types and versions, so I’ve pulled it. I’m working on CaseDetective 1.3.4, but it’s a little trickier than I thought due to what SQL syntax is and isn’t supported across different versions of Access, SQL Server and MySQL. It may take a couple of days to fully test an alternative way of fixing the bug that was supposed to have been taken care of by CaseDetective 1.3.3. Thank goodness I upload the website for each version to a brand new directory and switch a symbolic link from old to new. So to revert to 1.3.2 simply consisted of logging onto my web server and switching the symbolic link from new to old. Posted by ianmjones at 12:52 am on December 11th, 2007. Phew, last night I killed a bug in CaseDetective 2.0 in less than 30 minutes of development that had been bugging me (pun intended) for well over 4 weeks! And what’s more, 30 minutes later after re-activating another feature that I’d disabled because I had a bug in that code that had also been bugging me for well over 4 weeks was also fixed, without me making any further changes! I hate (love) it when that happens! The annoying thing is, my code for the first feature is virtually the same as before last night’s edits, I’d almost got the bug fixed before in that I’d whittled it down to a very specific block of code that I could hard-code around to get the results I wanted, but couldn’t get the proper solution to work, even though it looked absolutely right. I worked and worked on the area, making sure I fully understood the all the properties and events of the classes involved, but alas the solution failed to reveal itself. Out of frustration I switched one parameter to a function that should have absolutely no effect from “true” to “false”, fully expecting that the problem still existed. It fixed the problem. Fantastic! But also very very annoying. I can only assume it’s either a very subtle bug in the framework, or more likely me not quite fully understanding the event interactions of a couple of classes. I tell you, it feels great to have fixed these two problems, they were two great weights stopping me from progressing in important areas of CaseDetective, and stopped me from being able to efficiently concentrate on my work. A great weight has been lifted off my shoulders, full steam ahead! Posted by ianmjones at 1:32 pm on December 5th, 2007. Categories: AIR/Flex/Flash, CaseDetective, MicroISV, Software Development. A couple of weeks ago there was a discussion on the REALbasic NUG regarding what bug tracking systems everyone uses, and of course I chimed in with FogBugz! 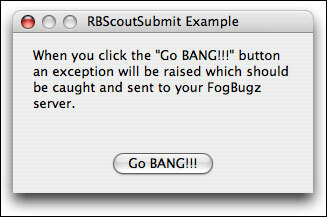 But I also mentioned that I could make my code for submitting crashes to FogBugz available. I had a few responses looking for the code, so I cleaned it up a little to remove some project specific stuff that was in the modules, created a simple little example program, and then sent the classes on there merry little way to those who responded. Even though these classes are pretty very rough, I decided to stick them up on this interweb thingy, you can find them in the Free Stuff section of my company website rbscoutsubmit Google Code project, along with the UNIX Crypt module I put up there some time ago. When you click the “Go BANG!! 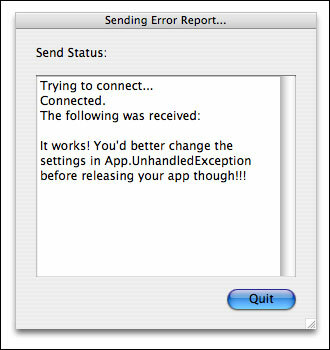 !” button in the example app an OutOfBounds exception will be raised (I’m referencing an element of an array that isn’t initialised). 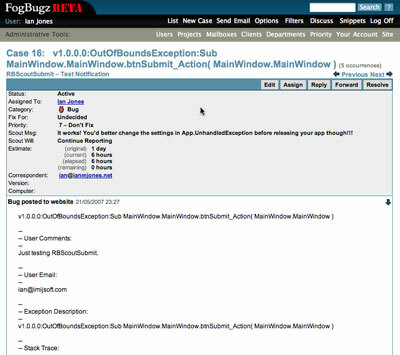 An “Application Error” window will be shown that says very sorry for going bang, and asks that the user submit the error report with details of what they were doing at the time. 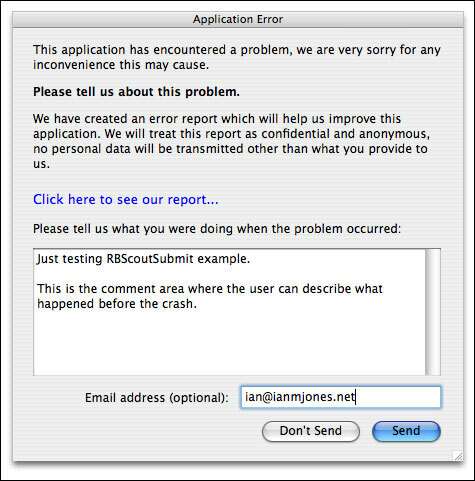 If the user wants to see what the error report contains before sending it, they can. This is always a good idea, gives the user a little more confidence that you haven’t just scanned their hard disk and are about to send out all their passwords! This report format can be changed by you (the REALbasic developer) to whatever format you like, and can include extra info if you like (e.g. in the Windows version I add info as to whether the user is an admin, and memory available, as these tend to be important). 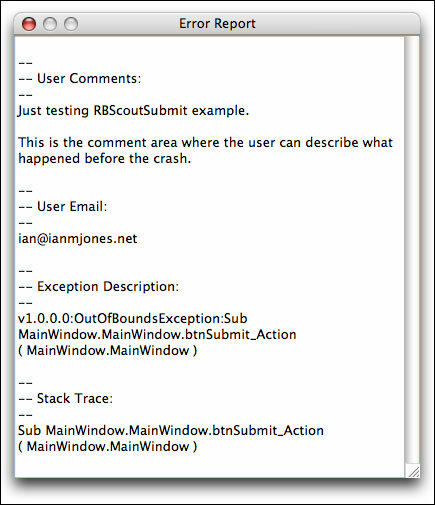 When the user hits the Send button, RBScoutSubmit uses your FogBugz installations’ scoutSubmit functionality to submit details of the crash. If you’ve set some pithy response on a case that already matches the Title, Project and Area submitted, the user will get that back (usually, “we’ve already fixed this, please update your version”), or some default “Thanks for submitting the report” message you supply in the application. In FogBugz a case will be created with the Project, Area and Title you baked into your application, and if the user added some comments and/or their email address, they’ll be available too. You can see in this last screen shot that my example message made it intact. If you want to give the classes a try, please do, the license is a standard MIT open source license, so you can do pretty much what you like with them except claim the code is yours (not that you’d want to)! Any suggestions on how to improve the classes, or if you want to submit code changes back, please drop me an email, there’s contact details in the README.txt. Posted by ianmjones at 10:38 pm on June 2nd, 2007. Categories: FogBugz, REALbasic, Software Development. I met Joel Spolsky last night, and have the t-shirt to prove it! Last night was the Edinburgh meet up with Joel Spolsky, it was great to meet a few fellow software developers (and the occasional electronics/hardware/embedded software developer) who also think Joel’s articles are a great read. 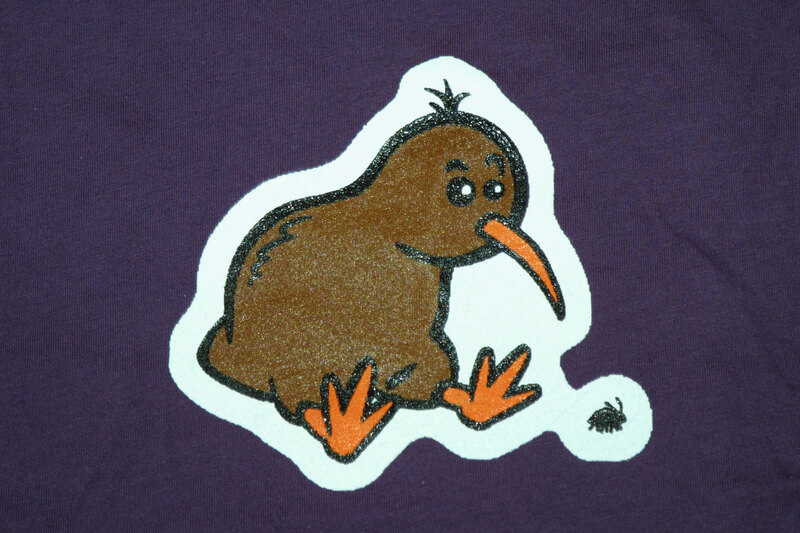 Although I seemed to talk to more Australian and New Zealand folk than I did Scottish, which is funny as I have often been accused of being from that area, and nearly moved there a few years ago, and it turns out Joel’s dad is from New Zealand. So after the meet last night Joel and I we went for a nice dinner at Le Sept, just round the corner from the meet venue, whence my grilling of Joel commenced! I thoroughly enjoyed the meal, we talked about all kinds of things related to software development, management, Fog Creek, FogBugz and other stuff. Joel’s a really nice guy, easy to talk to and very keen to share his knowledge, and also to help me out with CaseDetective where possible. I hope Joel enjoyed the evening as much as I did. Posted by ianmjones at 12:09 pm on May 20th, 2007. Categories: CaseDetective, FogBugz, Software Development. CaseDetective for FogBugz 1.3.1 released. Just a quickie to announce that CaseDetective 1.3.1 has been released; it includes a couple of bug fixes. If you’ve had any problems in creating an extract or PDF file from certain filters because the “Save As” window doesn’t appear after the options window, you’ll want this release. The issue was down to the default file name (filter name) being passed to the “Save As” window, if that filter name happened to have a “/” or other character in it that isn’t allowed in a file name, then the window simply failed to appear. The default file names for extract and PDF report files are now sanitised to only include alpha-numerics (a-z, A-Z, 0-9) and the space character, anything else is replaced with a hyphen. You can of course still change the file name once in the Save As window. Thanks to Rosemarie for helping me find the cause of this problem with her wonderful debug log file, your patience and persistence is very much appreciated. If you’ve had any problems with CaseDetective causing locking conflicts in your MS Access database, then you’ll also want CaseDetective 1.3.1. I’ve only ever had one report of this problem, and it turns out it wasn’t actually CaseDetective causing the problem anyway, but CaseDetective has been updated to explicitly connect in read-only mode to any ODBC, MS Access and MS SQL Server database. It’s probably belts and braces and CaseDetective only does read-only operations on the FogBugz database anyway, but it can’t hurt as CaseDetective never updates the database. Posted by ianmjones at 12:59 pm on May 8th, 2007. What's going on with the Joneses then? So, what’s going on with the Joneses then? 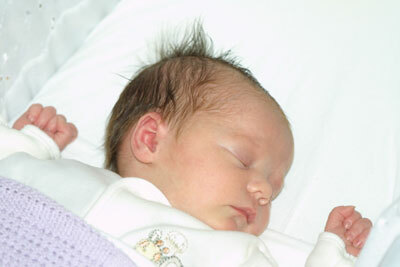 Well, as of today Abi is 1 month and 1 day old, and boy has she grown already. She’s gone from 7 pounds 3 and a half ounces at birth to 9 pounds and 2 and a half ounces, and out-grown a number of clothes already. Apparently this is very good growth, especially as she weighed even less when she left hospital, Mummy is obviously eating the right kind of stuff (which is a real surprise, believe me)! We’re not getting a lot of sleep at the moment, which impacts the rest of the day. Mummy often gets a nap for an hour or two during the day or late afternoon (when Daddy gets home) that she desperately needs, but Daddy catches up by having a night in the spare room every now and then. Although Abi has started to go about 5 hours through the night in the last couple of days, which makes a big difference. I’m starting to get into the swing of going to work a lot earlier than I have been until now. Before, I used to leave home between 09:15 and 09:30 to get into work for 10:00, but am now leaving just before 07:00 to get in for around 08:00 (traffic is much worse at this time of day). This means I get to leave work approx 2 hours earlier now, leaving at 16:30 rather than 18:30, which of course means I get a bit more time in the evening with the family. The idea being that because Abi is generally waking up for a feed between 05:00 and 06:00, I might as well get up and into work and therefore have more time in the evening for Abi, Mandy and then some work. I’m getting the Abi and Mandy bit in mostly, but work hasn’t really clicked back in yet, I’m way too tired most evenings. On the subject of work, development of CaseDetective hasn’t moved forward for some time, as you might imagine, but there are a couple of bug fixes I now know how to implement thanks to some great feedback from customers. 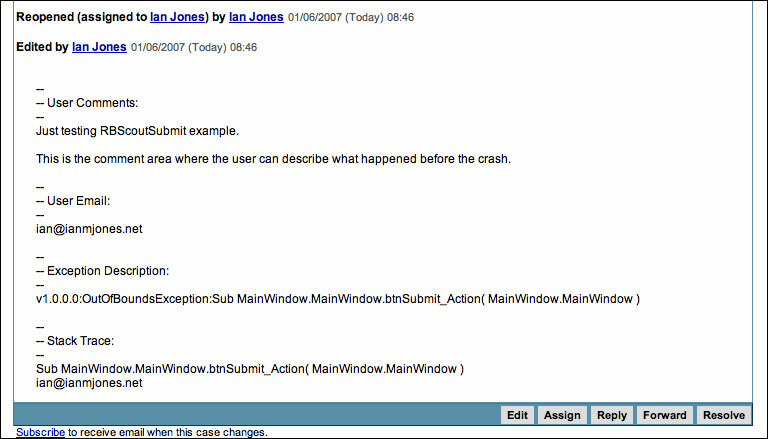 It sure does help when you get a good debug log and a customer who’s keen to find a fix to their problem. I hope to get a bug fix version of CaseDetective out soon. There are developments afoot in the world of FogBugz, there’s rumours of a new “service” that some “MicroISVs” might know about, I can say no more, and if you look in the right places you can see snippets of information that alludes to some of the new features in FogBugz 6.0 and it’s pending public beta release. Again, I can say no more, mainly because I have no more info, I have no more info than has leaked, I’m not privileged to any data that isn’t publicly available. But anyway, it’s exciting, and I’m looking forward to seeing what’s coming out of Fog Creek. Oh, and it seems like I might actually get to meet Joel Spolsky (co-founder of Fog Creek) next month in Edinburgh. I don’t suppose I’ll have much time with him as there’s 50+ people already signed up to the meet up, but still, should be nice to meet Joel. Posted by ianmjones at 5:33 pm on April 29th, 2007. Categories: CaseDetective, General, Software Development.